and what your donation can do. Your donation to Ecology Action means you are part of a global network of people working to replace hunger, poverty and environmental challenges with sustainable and healthy abundance around the world. 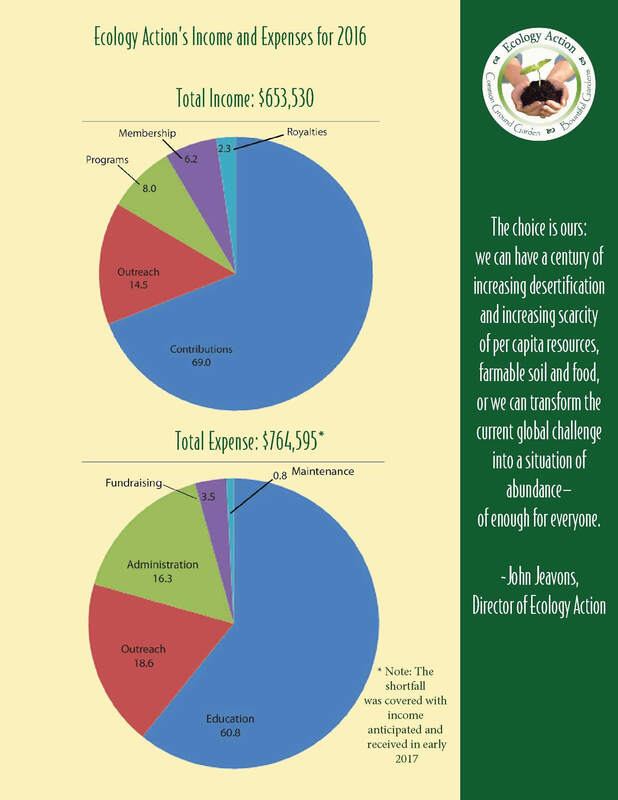 All donations and contributions to Ecology Action are tax-deductible. 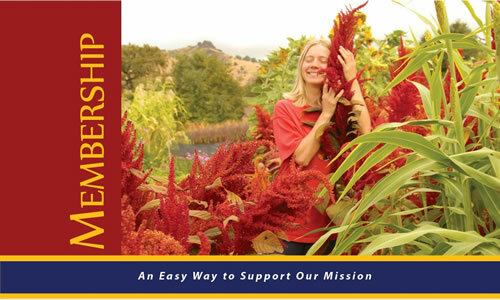 A yearly membership begins at $40 and includes Ecology Action's tri-annual newsletter. To donate or become a member, click the button above. A new window will open with our secure form hosted by networkforgood.org. donations[at]growbiointensive[dot]org, if you have any questions. Ecology Action's efforts to create a more sustainable future. As farmers, we know that we are all part of the great cycle of life, and that the resources of today can grow a beautiful and sustainable tomorrow for generations to come. 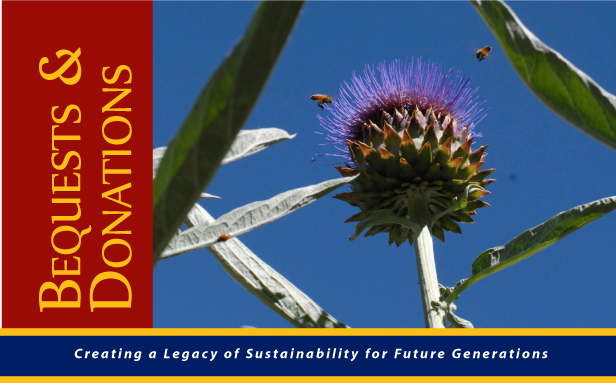 Bequests and donations are a way to support the continued growth of our sustainable agriculture education network into the future. Ecology Action has bequest plans available, including charitable remainder trusts and annuities. we will be glad work with you and your attorney. Another simple and effective way you can support Ecology Action is by offering charitable gifts through a one-time contribution or ongoing donations. 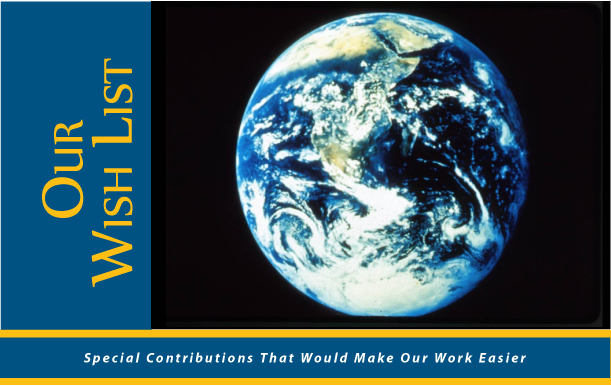 Memorial and Tribute donations are a wonderful way to remember or honor a loved one by building a better world in their name. A donation to Ecology Action can qualify as a U.S. tax deduction; individuals outside the U.S. should consult their nation's tax code. our programs, partners, proprosed projects and other ways to getting involved! Our internship programs provide a unique opportunity for enthusiastic people interested in creating a sustainable future to gain a thorough understanding of GROW BIOINTENSIVE sustainable mini-farming. Participants immerse themselves in the subject, living and working on location at one of Ecology Action's research sites, attending classes taught by our master farmers, gaining practical field experience, and working with other interns from around the world, building connections that will last a lifetime. Upon completion of the program, interns have gained the ability to apply and teach the method at a beginning and intermediate level. Our interns are more than students; through this program, they become part of the network of farmers, gardeners, researchers, teachers and policy makers that make up the global Ecology Action team. Our interns come from many different countries and cultures, and are determined to return to their communities and work hard to create a better, more sustainable future. These are fee-based, unpaid internships, and our resources for scholarships are extremely limited. Your support for will provide the opportunity for Ecology Action to accept more applicants who demonstrate the need for aid as well as a significant ability to use the skills they gain through an internship to benefit their communities and the planet. $16,000 provides a 6-month full scholarship for one participant. ...and donations of all sizes add up to help someone achieve success! Because the world needs more skilled, educated young people working to create a sustainable future, Ecology Action provides a 2-month summer internship program aimed at college students, designed to accommodate student summer break schedules. 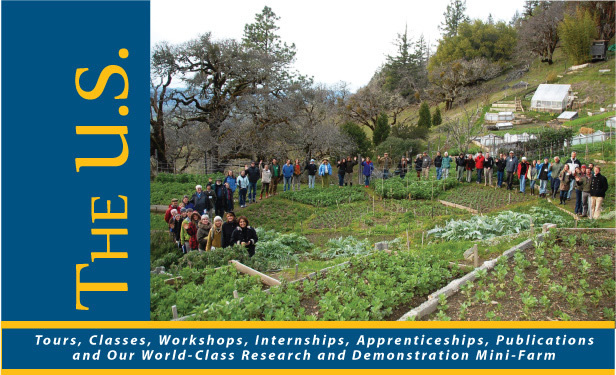 Though working on a compressed schedule, this 2-month program is similar to the 6-month internship in many ways, teaching participants the GROW BIOINTENSIVE method and focusing on using sustainable, small-scale, organic, non-mechanized, low-input food raising techniques to grow better lives and more sustainable communities. This two-month internship is an opportunity to learn valuable techniques and information, to experience an alternative living style, and to make lifelong ties with other interns from different states and countries. Interns will assist Ecology Action in accomplishing important work that can help farmers, gardeners, and communities around the world to raise food, conserve resources and build fertile soil sustainably. The program is a combination of lectures, study, garden work, and living the method. The program provides a solid foundation to launch a career in sustainable agriculture; once interns have completed their stay it is hoped they will continue their education and engage in public service for food security in communities across the country and around the world. This is a fee-based, unpaid internship, and our resources for scholarships are extremely limited. Your support will provide financially disadvantaged students with the opportunity to participate in this unique program. ... and will help Ecology Action grow our network of skilled GROW BIOINTENSIVE practitioners in the next generation of farmers, teachers, policy makers and citizens. Ecology Action's three-year Apprenticeship Program is an intensive, in-depth immersion program for participants who want to build a life and a career around practicing and teaching GROW BIOINTENSIVE Sustainable mini-farming. The program is designed to instill participants with the ability to understand and utilize the most effective and sustainable farming practices for a given situation, as well as the ability to train teachers, program members and project staff. This three-year commitment requires energy, responsibility and self-motivation. Apprentices live on site at Ecology Action's research sites, study and work full-time under the guidance of experienced Ecology Action staff, and participate in research and education activities in the classroom and in the field. The apprenticeship program is essential for building a base of farmer-teachers with highly advanced skills who can set up their own GROW BIOINTENSIVE demonstration gardens and farmer-to-farmer teaching sites in their own communities. Because it requires a large commitment of time and financial resources from the participants, it can be a challenge for many to complete the program. Your contribution can help these dedicated individuals achieve success, and can help build a stronger teaching base for sustainable agriculture around the world. Apprenticeship costs include tuition, room and board, medical insurance, tools, books, fuel and supplies, as well as incidental expenses. $22,000 covers an entire 3-year apprenticeship. Any contribution to this program allows us to continue to train these dedicated community-builders. The GROW BIOINTENSIVE Sustainable Mini-Farm at The Jeavons Center in Willits, CA is one of the oldest continuously running sustainable agriculture research and demonstration sites in the world. It's where we research and improve the GB method, teach interns and apprentices, and give workshops, classes and tours to the public. We have two additional research sites in Mendocino County that help us further develop the method and improve how it functions in different climates and environments. For those that can't be with us in the person, we continuously work to create, improve, translate and update our websites, videos, books, booklets, research papers and informational material, and other publications. These resources, often provided free of charge (especially online) give people around the world ability to teach themselves how to build food security and sustainable soil fertility. For example, our website provides high-quality how-to videos, and a self-teaching manual free to the public. Our flagship publication "How to Grow More Vegetables" is now in its 8th Edition, and has been translated into Spanish, Arabic, Hindi, German and French - and we're working on getting it into more languages to make it more accessible. $300/month covers shipping to send translated publications to low-income people in other countries. $6,000 keeps our websites updated and running smoothly for 6 months. $15,000 helps us take a workshop to a disadvantaged community in the US. $30,000 funds the production of another how-to video. This is just a sample of the many projects we work on. Donations of all amounts are greatly appreciated. Imagine the world we can grow together! Ecology Action is heading a $9.05 million dollar campaign to create an African Mini-Ag Training Center Network. In conjunction with our African partner organization, the GROW BIOINTENSIVE Agriculture Center of Kenya (G-BIACK), this 4.25-year project will catalyze the training of an estimated 1.06 million African farmers at a cost of approximately $9.00 per person. 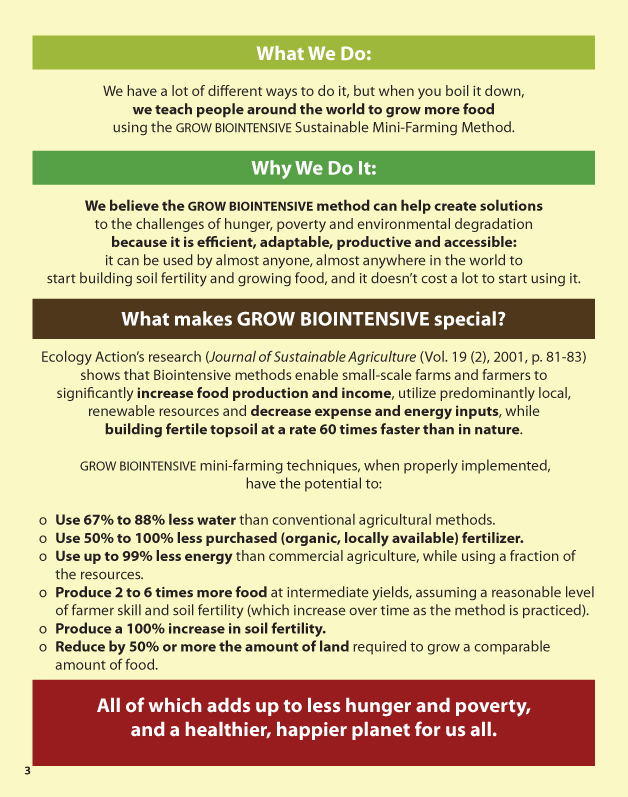 The basis of this program is the enhancement of a Mini-Ag Training Center/Soil Test Station ("Center") in Kenya, designed to train farmers from Kenya, Ethiopia, Tanzania, Malawi, Mali and Ghana (the main program participants) in Ecology Action's GROW BIOINTENSIVE method. These countries have been selected for inclusion in the program because they have significant need, and also have cultures/environments that are compatible with our program goals and methods. The program will also teach participants (to a lesser extent) from Mozambique, Uganda, Guinea Bissau, and Cape Verde, Botswana, Lesotho, South Africa, Swaziland, Zambia, Zimbabwe, Sierra Leone and Senegal, which can also benefit from having a group of trained farmer/teachers to lay the groundwork for an expansion of this program in the future. 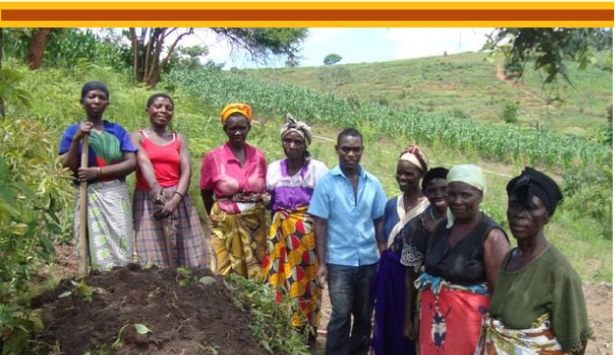 Program participants will learn to grow a complete diet in a small area, to produce soil-building materials to create sustainable fertility all in the same area, as well as produce a good income while honing their community-building and teaching skills. The project will implement a farmer-to-farmer education program, in which farmers are trained at the primary Center, and then return to their own communities to establish secondary Mini-Ag Training Centers, where they will teach others what they have learned. They will encourage the people they teach to teach others in turn, creating an expanding network of food security, prosperity and community-building activities. 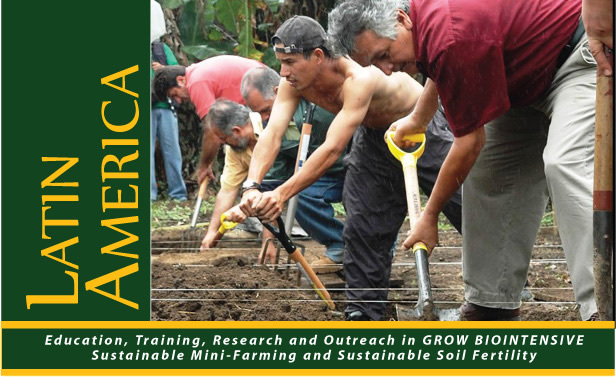 This program, which is based on similar smaller-scale training programs created by Ecology Action in the US, and by Ecology Action partners and associates in Kenya and Latin America, will focus on achieving several goals centered on providing tangible benefits to the small farmers and their communities in the region. These include: Improving food security, reducing chronic hunger, and improving the quality of nutrition, increasing sustainability, and empowering African farmers to create sustainable and uniquely African solutions to the challenges confronting them. We are seeking the support of a major donor, or donors, to help us achieve success in this endeavor. but if your goal is for lifetime, then invest in training." 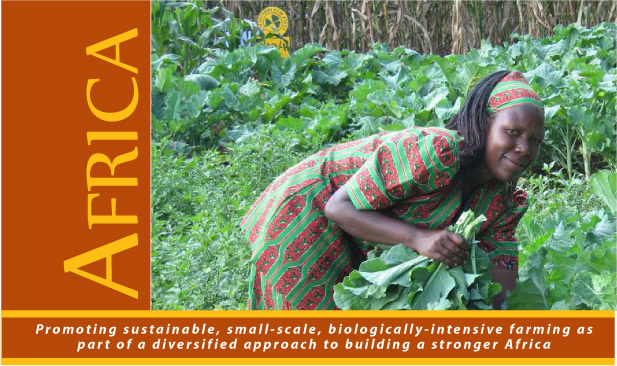 The GROW BIOINTENSIVE Agriculture Center of Kenya (G-BIACK) is located in Thika, Kenya and was founded by husband and wife team Samuel Nderitu and Peris Wanjiru Nderitu. G-BIACK functions as a training center for people in the region, and has trained thousands of farmers to become more effective at raising food and community building. We are seeking to expand and improve the training program and facilities through the Mini-Ag Training Center Network initiative described on the previous page. For more about these and other international partner organizations and projects, click here. take part in concrete actions to take care of their soil, environment and natural resources." This program, which is based on smaller-scale training programs created by Ecology Action in the US, and shown by ECOPOL and our other regional partners to be extremely effective in Latin America, will result in hundreds of thousands of people being educated in sustainable agricultural methods designed to reduce hunger, poverty and environmental damage: 331,000 people in 6 countries, directly and indirectly trained for $3,000,000, or an average of $9.06 per person; plus, 111 GROW BIOINTENSIVE Basic-Level and 16 Intermediate-Level trainers certified to continue the education process into the future. Ecología y Población, (ECOPOL) has been Ecology Action's nonprofit affiliate in Mexico, and Central and Latin America since it was founded by Juan Manuel Martinez in 1992. ECOPOL teaches families to raise food Biointensively, and has provided education programs in all 22 Latin American countries. 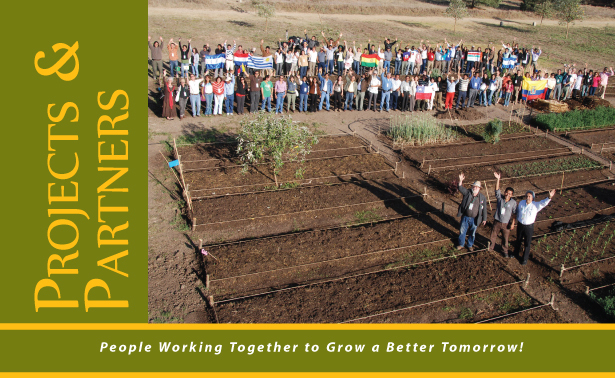 As a result of ECOPOL's work, an estimated 2 million Biointensive gardens have been initiated in all of Mexico's 32 states, and state-sponsored organizations like SEMARNAT and CECADESU are eager to support and promote GROW BIOINTENSIVE -- something that represents a sea-change in the way Latin American countries are viewing the future of agriculture in the region. This vote of confidence shows us that the work we and our partners have been doing is creating real change, and gives us hope that the goal of global sustainability we have been working towards over the past 40 years is on its way to becoming a reality. Your contributions help programs like this stay alive. Fundación ADYS, in Ecuador, is Ecology Action's non-profit affiliate in Ecuador. This organization, founded by educational psychologist Mercedes Torres Barriero, has helped over 5,000 indigenous Quechua, Chachi, Aiwa, Montubio and Epera families to use Biointensive methods, and has directly and indirectly educated over 90,000 people. One of ADYS's most successful Biointensive projects is at Lago Agrio, in the Ecuadorian Amazon. Colombian refugees migrating to the area impacted the ability of local people to feed themselves. ADYS encouraged the residents to grow Biointensive gardens and by the end of the program there were 60 gardens in Lago Agrio and surrounding areas and 16 gardens at the Colombian border. The 76 gardens fed about 2,400 people, both refugees and very low-income locals. The Ecuadorian government, the UN-FAO and UN's High Commission for Refugees in Ecuador all gave support to this project. Las Cañadas is a small, wholistic living community owned and managed by Ricardo and Tania Romero, both trained by Ecology Action in Biointensive techniques, with much of its food- and seed-producing area managed by Karla Arroyo Rizo, a former Ecology Action Intern. 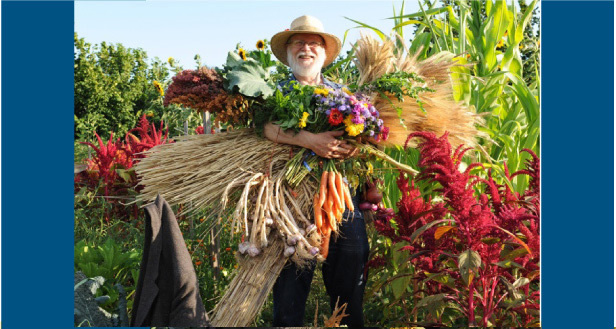 The site offers 6-day GB workshops, 120 Biointensive beds (including a 40-bed demonstration and teaching unit) and an education program for school children who come to tour the garden. Ricardo, ECOPOL Director Juan Manuel Martinez, and others are developing a proposal to develop part of the Las Cañadas into a major training center for people from all of Latin America. With Ecology Action, ECOPOL and ADYS, Las Cañadas was a part of the Latin American Conference 2010: Biointensive Agriculture Facing Climate Change, which inspired the United Nations to add a GROW BIOINTENSIVE page to the UNCCD (United Nations Convention to Combat Desertification) website. Ludmilla Zhirina and Dr. Igor Prokofiev of Bryansk, Russia, started the non-profit Viola after their region received fallout from the nuclear accident at Chernobyl in 1986. The organization is made up of teachers, doctors and students determined to do whatever they can to educate the population on the dangers of radiation and on methods of cleansing the body of radioactive substances. Inhabitants of the Chernobyl region have to grow their own vegetables and grains in areas where radionuclide levels can be 10 to 30 times normal. Each year since 2002 VIOLA conducted experiments to see if radionuclide contamination of the vegetables could be reduced using Biointensive techniques. Test plots were used, growing the same vegetables with Biointensive techniques and with conventional methods. The yields from both types of agriculture were tested in a laboratory, and soil samples were tested with a Geiger counter. In the section using Biointensive, contamination of the soil was decreased , and the vegetables grown biointensively contained fewer radionuclides than those grown conventionally. Some vegetables were practically free of contamination while others were only 2-3 times more contaminated than the norm (as opposed to 10-30 times). The studies have shown that saturating the soil with compost ties up Cesium 137 and St-90, making it less available for the plants to take up. Companion planting has also been shown to be helpful in reducing food radiation levels: when beans and potatoes were grown together, beans took up the radionuclides into their leaves but not their fruit. When planted with beans, the potatoes did not get contaminated. Since the nuclear disaster in Fukushima, Japan following the earthquake and tsunami of 2011, this research is even more vital. Ecology Action would like to send $500 per month to Dr. Prokofiev to help keep the experiments going. Your contributions will help continue to keep this program functioning smoothly, and expand it into other areas of Russia and Asia. For more about this and other international partner organizations and projects, click here. or if you would like to connect Ecology Action with a major donor, please do not hesitate to contact us. check out growbiointensive.org/events_main.html for education opportunities! Start a petition and get at least 200 people to show interest in attending a class, and then send us a notice! our how-to videos and free self-teaching booklet can show you and your friends how to get started! The Sustainable Vegetable Garden is great for beginners! a list of special ongoing projects we're hoping you'll support with your tax-deductible contributions. Please know that we are happy to receive contributions for a portion of any of the amounts listed above. or call (707) 459-0150 between 10 AM and 3 PM PST. 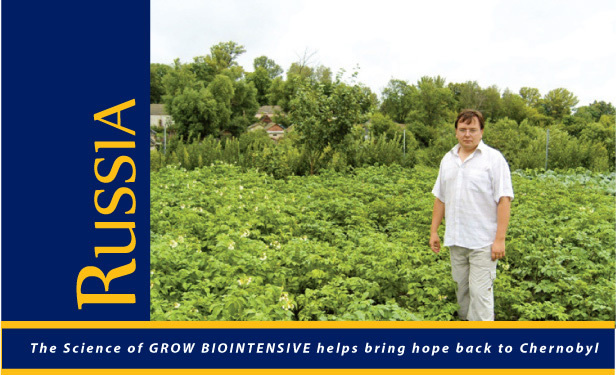 Aware of intensifying world challenges and the basic need of people to feed themselves, we have been working for 40 years to develop an elegant, small-scale agricultural system — GROW BIOINTENSIVE® Sustainable Mini-Farming — that when practiced correctly, nurtures healthy soil fertility, produces high yields, conserves resources, and can be used successfully by almost everyone, everywhere. Our goal is to help this system be known and used locally...on a worldwide basis. Our path to accomplishing this goal lies in our training programs and our publications, and the financial support of our members and donors. Through the generous contributions of visionary people like you, Ecology Action has catalyzed many projects worldwide—projects which have put down strong roots and have been the means by which hundreds of thousands of people have learned how to successfully grow their own food and to grow a better, more sustainable life. As our projects continue to grow and flourish, the world presents an increasing need for the expansion of existing projects, and the creation of new programs to attend to the challenges presented by climate change, food security, resource scarcity and population growth. We're glad you're interested in our work, and hope that you will join us in growing a better world. In the following pages you will find short descriptions of some of the programs that need your help. but to build a thriving community together. requiring $162 million in emergency food aid. farmers who graduated from Ecology Action's Internship Program. take root across Latin America, Africa and the Pacific Rim. sustainable agriculture in communities across the county. help millions of people across the world to take control of their own food security. 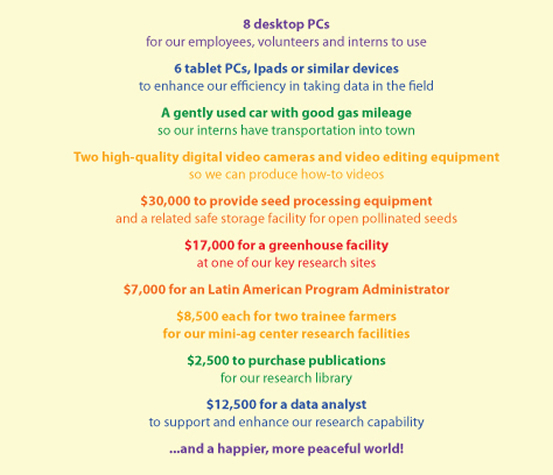 Your contribution means all this ...and much, much more.